The neighborhood that surrounds Luther Seminary is called St. Anthony Park, a residential community situated within the heart of the Twin Cities. St. Anthony Park is home to neighborhood shops that include Micawber’s Books, Finnish Bistro, the Bibelot Shop and more. Attending Luther Seminary, however, does not limit you to a small-town atmosphere. The great thing about Luther Seminary is that you are minutes away from downtown Minneapolis and St. Paul. The Twin Cities are wonderful communities in which to live, work, learn and play. There are also plenty of options for shopping, hotels and restaurants in nearby Roseville. Whether you looking for a small-town neighborhood feel, or craving a big city experience, Luther Seminary gives you access to both. What are the Twin Cities? the term “Twin Cities” is a nickname given to Minneapolis and St. Paul? Saint Paul is the state capitol, but Minneapolis is larger? the downtowns of these cities are a mere 9 miles apart and share the same airport? the Twin Cities is one of the largest metro areas in the country? the Twin Cities have earned top rankings on the national level when it comes to livability, being bike- and runner-friendly, local music scene, finding a job and cleanliness. 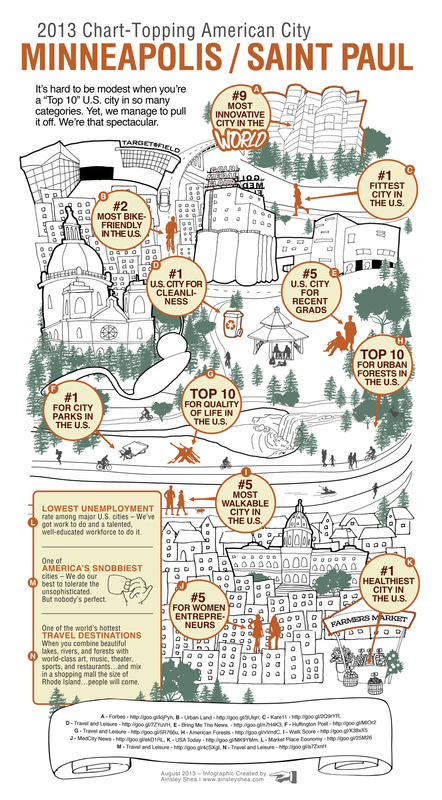 See other Top 10 honors the Twin Cities garnered in this infographic. Whatever you are hungry for at this exact moment, the Twin Cities can almost certainly provide it. From local establishments to national chains to a variety of international restaurants offering cuisine from all corners of the world, your appetite will not come away unsatisfied. The Twins Cities offers an impressive wide-ranging array of cultural and recreational opportunities. Having family and friends for a visit? Browse these nearby hotels. Check out CITYPAGES, a free magazine, and our local newspapers (Star Tribune and Pioneer Press) for more entertainment options around town. The Twin Cities provides visitors and residents with easy and affordable access to public transportation.